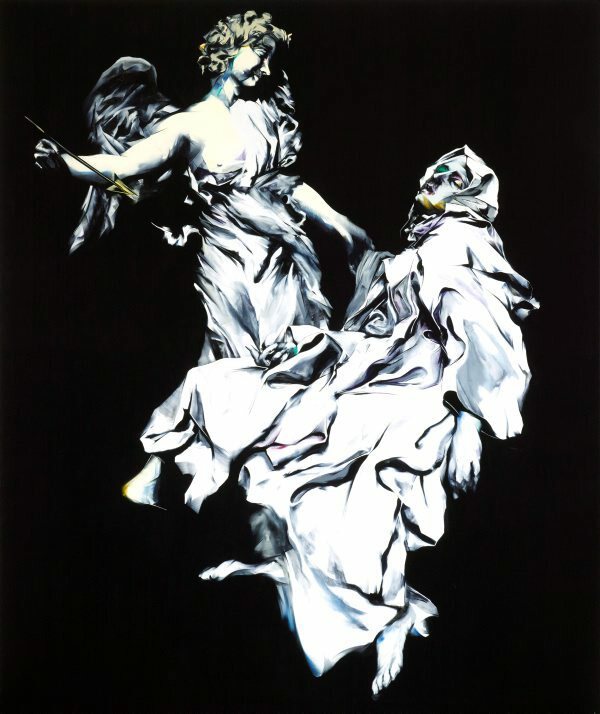 Nigel Milsom's 'Judo house part 6 (the white bird)' 2014-15 is a homage to the Italian Baroque artist Gian Lorenzo Bernini's altar sculpture 'Ecstasy of Saint Teresa' 1647–1652, a detail of which he encountered in print. Bernini's fervent work depicts the nun being repeatedly stabbed through the heart by an angel during a violent but blissful spiritual visualisation. Milsom was attracted to the formal qualities of the reproduction but also Bernini's representation of formal and thematic dichotomies (pleasure and pain; corporeal and spiritual; light and shadow), perhaps because contrasts have similarly framed Milsom's life and work to date (figuration and abstraction; light and dark; success and tragedy). Curator Rachel Kent agrees, suggestsing that the work reflects an 'acute sense of recognition…between the two opposing figures, or life forces, and the overwhelming emotions depicted .